Oak Forest (with approximately 5,500 homes) has been one of Houston’s best performing real estate markets over the past decade. Oak Forest is located north of the 610 Loop and east of U.S. Route 290. Oak Forest is also near West 43rd Street, between T. C. Jester and Interstate 45. View pictures and information of all Oak Forest homes for sale below. I am interested in Oak Forest East and would like to get more details. 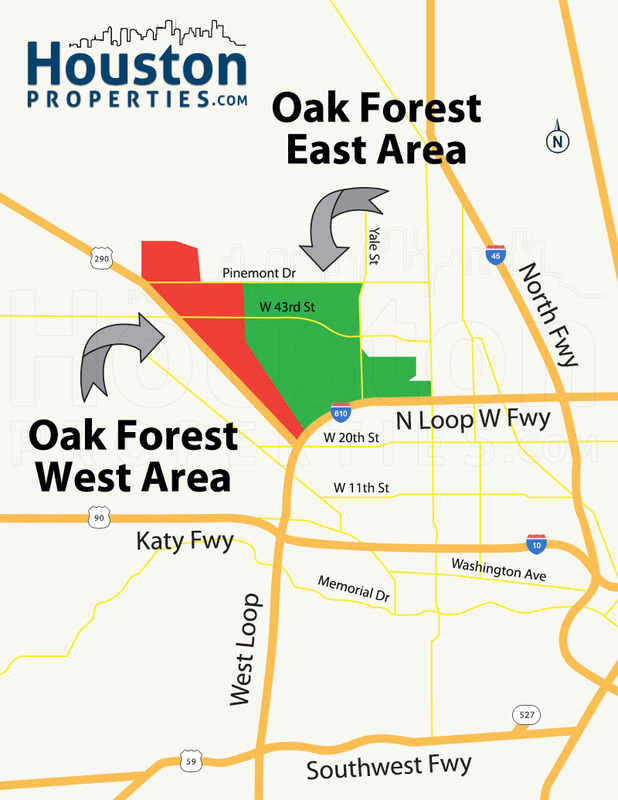 Oak Forest is Harris County’s third largest group of subdivision, behind only to Kingwood and Sharpstown. Developed in the 1940s, Oak Forest is also known today for having some of the best-rated public elementary schools in Houston. (Learn more about Oak Forest Schools here). Homes in Oak Forest have greatly appreciated in value over the last 10 years. Over the past decade, the average price per square foot of single family homes in the neighborhood jumped by 79%. Homes also continue to sell well, with last year’s total sales netting a 31% increase. Oak Forest homes lie just outside Houston’s Inner Loop. Residents have easy access to major highways connected to the hottest districts in Houston. Numerous neighborhoods are close to Oak Forest too. Neighborhoods near Oak Forest include: Garden Oaks, Greater Heights (Houston Heights), Spring Branch. Timbergrove, Lazybrook, and Memorial. Downtown Houston and Galleria are also only about a 10-minute drive or commute away (depending on traffic). Only 10 minutes away from the main Houston districts Downtown Houston and Galleria, Oak Forest homes for sale are also known for having big yards (median lot size is at 7,427 square feet). Master-planning and deed restrictions also allow homes to be a few minutes away from schools, churches, and parks. The Oak Forest Homeowners Association has divided the esplanades in and around Oak Forest into 10 sections. Aside from mapping purposes, these sections help the association plan scheduled maintenance, community improvements and its Caretaker Program (Oak Forest’s beautification program). Parts of Oak Forest is also zoned to Clifton Middle School. Clifton Middle School got a 7 out of 10 GreatSchools.org ranking, with its students scoring between 6 to 23 percentage points higher than the state average in various subjects. Built in 1951, Oak Forest Elementary School is one of the oldest and highest rated elementary schools in Texas. Greatschools.org gives it a 9 out of 10 score – one of the highest marks in Texas. Oak Forest Elementary School students scored between 6 to 18 percentage points higher than the state average in the subjects of Writing, Science, and Math. Greatschools.org gives Clifton Middle School a rating of 7 out of 10 due to its students’ strong test scores particularly in Math. Clifton Middle School testers scored between 6 to 23 percentage points above the average score in Texas. Waltrip High School is rated 5 out of 10 by Greatschools.org. While it remains average in most subjects, its Grade 11 students got between 91% to 98% test scores in English Language Arts, Math, Science, and Social Studies. Christian School of Northwest Houston at 6720 W Tidwell Rd. Memorial Hall School at 3721 Dacoma St.
Montessori Children’s Cottage at 4009 Sherwood Ln. St. Ambrose Catholic School in at 4213 Mangum Rd. St. Rose of Lima Catholic Church at 3600 Brinkman St.
Temple Oaks Baptist School at 2101 W 34th St.
To find an updated listing of all Oak Forest real estate zoned to any specific public school, please email Paige Martin at Paige@HoustonProperties.com with the property type and budget that you’re looking for.